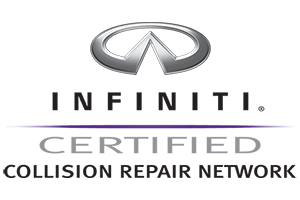 For minor or major damage to any INFINITI model car or SUV, Larry Walker and Sons Body Shop is trained and equipped to take care of our INFINITI customers the same way the dealership would. Our I-CAR trained technicians have exclusive access to repair protocols, steps and original INFINITI parts designed for your vehicle. It is always wise to check your insurance coverage for guidelines about original parts but as an INFINITI Certified Collision Repair Network, we recommend the use of original parts for your vehicle. Please call Larry Walker and Sons or fill out your information onlineso we can get you and your vehicle back on the road!